Openings for the 2018 Adv Fishing School. Openings for both sessions. Call Mark @ 406-459-8739 or email him mark@headhuntersflyshop.com for any questions about our schools upcoming. Want to get better at fishing the Missouri River? Want to improve your dry fly cast? Presentation? Fish finding skills? Well we do too! And this fall we once again offer Headhunters Fly Shop Advanced Fly Fishing School. We offer two sessions this October with the first being Thursday evening October 4th thru Monday morning October 8th. The second session begins Thursday evening October 18th and finishing Monday morning October 22nd. This is not a school for novice anglers. This is a school for intermediate to advanced anglers wanting to push the limit of trout fishing. We have structured the classroom and on the water sessions for advanced anglers. This is an all inclusive Fly Fishing School. From meals, to classroom sessions, instruction from Headhunters top guides, class handbook, and some cool swag you take home with you. But the experience and the knowledge are the two biggest keys to your success. This is a school structured for those who are looking to get a leg up on the competition. All those finicky trout in this world. Think of it as a 400 level college class. 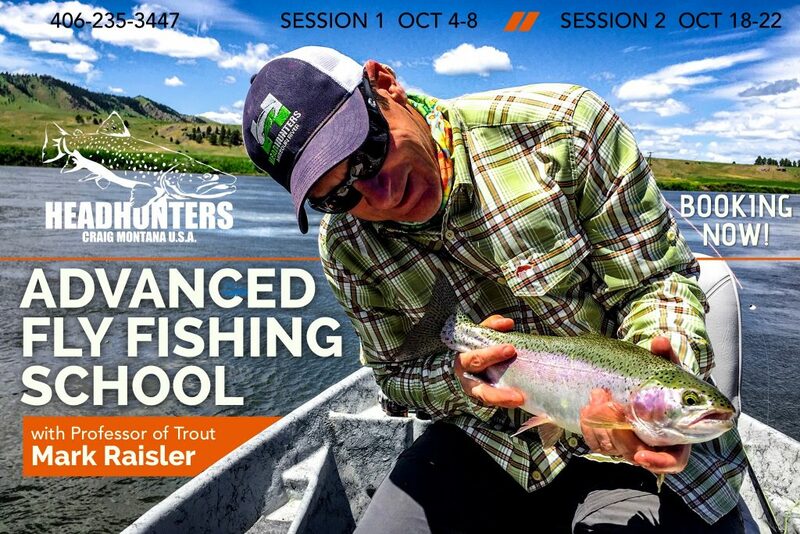 We will present advanced techniques including casting, fish finding, water reading, bug selection, presentation styles, knots, rigging techniques…tons of information to give you the necessary tools to tackle difficult fly fishing situations. A classroom session in the morning followed by about 6-7 hours on the water with personal attention and instruction with your guide/instructor. Each day is dedicated to a specific discipline. Dry fly fishing, nymph fishing, and streamer fishing. Although just like the the trout we can adapt and be fluid. We can certainly adapt for the type of learning you desire. If you want to fish for rising fish daily as opposed to wearing your arm out streamer fishing, we can do that. If you want to streamer fish between dry fly spots? We got you. If you want to focus on wade fishing deep bucket nymphing? We will accommodate. The morning classroom sessions are more rigid but the remainder of your time is open to personal scripting. Appetizers, a glass of wine or beer, and dinner back at the lodge is what will occupy your evenings. A great time for fellowship, exchange of ideas, and relaxation time. Then get a good Montana’s night sleep and get after it again in the morning! This year we are adding instructors that will present a 45 minute dissertation on Missouri River entomology, Streamer Techniques and Rigging, Dry Fly Secrets to Success, an insider track to cracking the Missouri River code. Chef Kelli Wilson will again be on site to prepare our meals, apps, and breakfasts! A real treat to have Kelli joining us for this Headhunters Fly Shop event. Lunches provided on the river. Breakfast and dinner at Montana’s Wolf Creek Lodge. Let us know in advance if you have an dietary restrictions. Salad or Gluten Free options available. Prior notice will guarantee you get food appropriate for each individual. Thursday: Arrival date. Check in @ Headhunters. 4-6pm meet and greet @ WCLodge w/ appetizers. Powerpoint presentation by Mark, and dinner. Friday: Breakfast 7:30am. Morning presentation 8:30am. Meet guide and go fish 9:45am. Return to lodge at dark. Apps and dinner. Saturday: Breakfast 7:30am. Morning presentation 8:30am. Meet guide and go fish day two 9:45am. Return to lodge at dark. Apps and dinner. Sunday: Breakfast 7:30am. Morning presentation 8:30am. Q & A. Meet guide 9:45am. Fish and learn all day long! Return to lodge at dark. Apps and last night award ceremony! Dinner. Monday: Breakfast 7:30am. Check out @ Headhunters. Thanks! All inclusive*. Lodging, meals, swag, guides. The food will be great, the comfortable lodging fits in perfectly for what you are after, the location is the Missouri River of Montana, an opportunity to improve your tailwater/spring creek angling skills, classroom sessions designed to level the playing field, unique swag, and wonderful fellowship to boot. We truly enjoyed the 2017 Advanced Fly Fishing School and look forward to seeing and fishing with you October 2018 here on the Missouri River Montana! email Mark mark@headhuntersflyshop.com for additional information regarding this fly fishing school that will fill quickly. Disclaimer: This Advanced School is for single handed anglers. If you are interested in getting on top of your Trout Spey game we offer clinics and private instruction here at Headhunters Fly Shop. Inquire within for educational opportunities. We offer private lessons at anytime. Or guided trips with a focus on learning the river, casting improvement, swing spots, or anything you can think of. Design your own day today! Any trout spey clinics in the works for 2018? Yes. Planning right now Richard. By September you should see a plan put together. Thanks Richard! Can you get me in the first session ? Oh yeah Don. Call up Julie and she will get you on board. Love to have you! First time the stars have aligned right to let me participate. Looking forward to it!